On September 25th, the Smithsonian's National Museum of Natural History in Washington D.C. hosted a gala for the opening of their new permanent exhibit, the Sant Ocean Hall. Suspended from the ceiling above the center of the Hall is the focal point of the exhibit--a full size model of a North Atlantic right whale. It's an actual replica of a cataloged individual, a female named Phoenix. You can see photos and a history of Phoenix on the North Atlantic Right Whale Catalog, search for catalog #1705. Since 2004 Amy Knowlton and I have been working with the Smithsonian to make sure the model, and every other detail of information about right whales, is as accurate and up-to-date as possible. Because of that long relationship helping to develop that aspect of the exhibit Amy and I were invited to the black tie event, along with New England Aquarium Vice President of Research (and our fearless leader) Scott Kraus. It was a great evening to see Phoenix and read all the information about right whales that we had spent years reviewing, and also to be the first (along with 1500 other guests) to see the exhibit. The Sant Ocean Hall is 23,000 square feet of fun facts and education about the world's most precious resource: the oceans that cover 71 percent of the earth's surface. The exhibit includes more than 650 marine specimens ranging from microscopic plankton to giant squid (and Phoenix, of course!) There are state of the art inter-active exhibits, video displays, and so much more than we could possibly see in the three hours we were there. We whale researchers, typically most comfortable in jeans, had to dress up and rub elbows with the elite of Washington. For some reason, we weren't featured in the New York social diary (scroll past first article) but as you can see we managed to look presentable! Coming in our fall sponsorship newsletter we'll have an article about the creation of the model and our involvement in the project, as well as more about the opening itself. If you want to read more about it, here's the link to our sponsorship program. For further information about the exhibit including images of Phoenix, check out the Smithsonian's Sant Ocean Hall page and read event reviews from the New York Times and the Washington Post. If you have been captivated by our blog and would like to help support right whale research, then the right whale sponsorship program may be for you. Choose one of the six whales and receive a photograph, composite drawing, map pinpointing all the places your whale has been sighted, a one year subscription to Right Whale Research News - the biannual newsletter authored by the New England Aquarium's Right Whale Research Team, and much more. 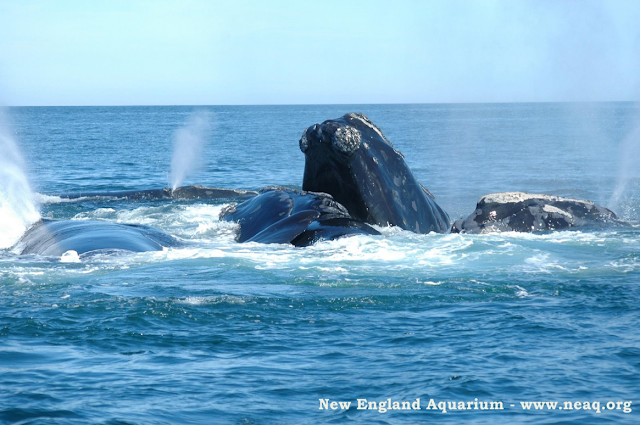 To learn more about the right whale sponsorship program and to sponsor a right whale online click here. Photo Caption: Right whale feeding in the Bay of Fundy (top) and R/V Neried photodocumenting a right whale (bottom). We are extremely pleased to report that the Final Rule (pdf) to implement Operational Measures of the North Atlantic Right Whale Ship Strike Reduction Strategy has passed the final hurdle in the rulemaking process and will be published in the Federal Register tomorrow, October 10. The rule will go into effect in 60 days--early December--just in time for the start of the winter calving season in the southeast United States. 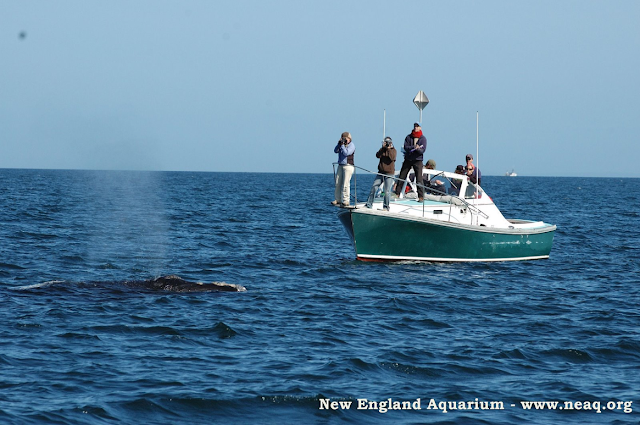 The crux of these measures will be the requirement to slow ships to 10 knots or less within 20 nautical miles of port entrances and in other major right whale habitats. Despite the fact that it is not as strong as initially proposed due to political wranglings, which I covered in an earlier post, it is a monumental and unprecedented step towards reducing the possibility of vessel strikes of right whales and other large whales living in our near shore waters. We applaud NMFS for pushing this rule forward despite heavy opposition from the administration and the shipping industry. The science is strong and the need is great to give these endangered whales a safer haven. For more details about the rule, visit the NOAA shipstrike page. Photo by Harriet Corbett/New England Aquarium, published in the book The Urban Whale: North Atlantic Right Whales at the Crossroads. 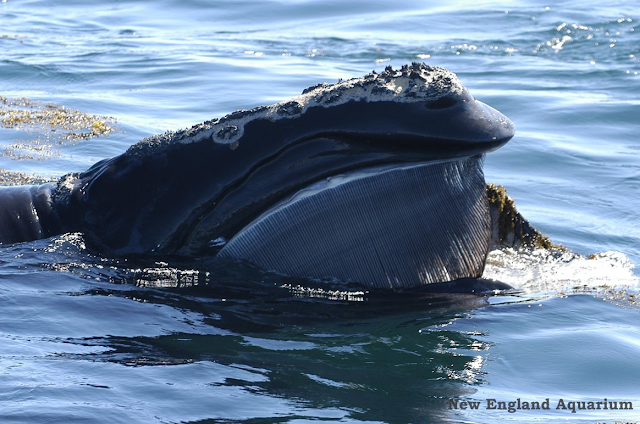 Vessel strikes are the leading known cause of right whale mortality from human activities. The shape, behavioral characteristics and habitat preferences of right whales make them especially vulnerable to being struck by vessels. Right whales are difficult for mariners to see, especially in rough seas and at night due to their low profile and dark coloration. Right whales are black, have a broad back and no dorsal fin. They move slowly and they spend extended periods at or near the surface. Typical behavior includes resting at the surface, social activity (i.e. courtship), skim feeding (i.e. swimming slowly near or at the surface as they filter zooplankton from the water), and nursing their young. They appear to not be aware or slow to respond to approaching vessels. Roseway Basin--a place where right whales feed and socialize in the summer and fall--is located about 30 nautical miles south of Cape Sable Island, Nova Scotia and is one of two conservation areas for right whales in Atlantic Canada. The second is located in the Bay of Fundy, a summer and fall nursery area and feeding habitat. The 1993 designation as conservation areas by the Canadian government provided recognition, but no extra protection, to the whales inside the area boundaries. Vessel traffic was not excluded from the areas. In the Bay of Fundy, a female calf named Calvin provided the impetus to relocate the Bay of Fundy shipping lanes; she was orphaned when her mother died as the result of vessel strike in 1992. In 2002, the International Maritime Organization (IMO) adopted an amendment to the existing shipping lanes. 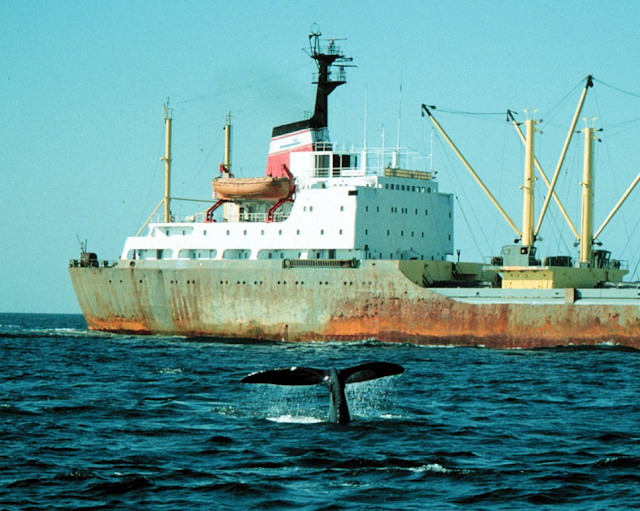 Implemented by Transport Canada in July 2003, the measure directed large vessel traffic around the aggregation of right whales reducing the probability of a vessel/whale interaction by 90 percent. After the success in the Bay of Fundy, we turned our attention to Roseway Basin, the second summer and fall haunt of right whales. The process to reduce the risk of vessel strikes began with right whale sighting data collected in Canadian waters since the early 1980s (primarily by the New England Aquarium) and data crunching by Bob Kenney at the University of Rhode Island, and Christopher Taggart and Angelia Vanderlaan at Dalhousie University. The analyses of shipping routes and right whale sightings in the area by Dalhousie researchers indicated that, with the declaration of an Area to be Avoided (ATBA), the probability and risk of vessel collisions with right whales could be significantly reduced with minimal disruption to ship routes. Although the total number of ships that actually transit the area was not known, an estimate was made using ECAREG (Eastern Canada Vessel Traffic Services Zone), ICOADS (International Comprehensive Ocean-Atmosphere Data Set) and AMVER (Automated Mutual-Assistance Vessel Rescue System) data sources. Based on these reporting systems, it was been estimated that a minimum of 1,700 ships navigate in and around the area annually and that many of the vessels are bound to or from ports in Halifax, Nova Scotia; Saint John, New Brunswick; the United States; the United Kingdom; Russia; Belgium; Norway and other European destinations and the route used generally reflects the Great Circle route from Europe and the East Coast of North America. In April, 2007, the proposal for an ATBA designation south of Nova Scotia was submitted to the IMO by Transport Canada, and had a great deal of support from Canadian industry (e.g. Irving Oil and Atlantic Pilotage), government agencies (Transport Canada, Fisheries and Oceans Canada and the Canadian Marine Advisory Council), scientists (National Marine Mammal Peer Review Committee of DFO) and the Canadian Right Whale Recovery Team. Special accolades are due to Lindy Johnson of NOAA (pdf bio) for garnering support from the U.S. delegation to IMO. In October 2007 the IMO adopted Canada's proposal to designate 980 square nautical miles of Roseway Basin as an ATBA. That means that vessels of 300 gross tons and above will be recommended to steer clear of the area from June 1 to December 31. The measure went into effect on May 1, 2008 and while the area will be recommended rather than mandatory, it was anticipated that the marine community would heed the recommendation and give way to the whales. There is always an option to return to IMO to seek mandatory measures if the recommended ones are not sufficient. In 2008, the New England Aquarium and Canadian Whale Institute once again in collaboration with our colleagues at Dalhousie University initiated a marine stewardship recognition program for the Roseway Basin ATBA. Dalhousie scientists are monitoring, in near real time, vessel traffic in the vicinity of Roseway Basin to measure compliance with the ATBA through their Vessel Avoidance and Conservation Area Transit Experiment (VACATE). They are using Automatic Identification System (AIS) technology that transmits static, dynamic, and voyage related information including vessel position, speed, heading, destination, and vessel type. The VHF radio transmissions are received using a Bell-Aliant cell tower and antenna located near Cape Sable Island. Dalhousie scientists are using the AIS data to determine the routes of vessels in the Roseway Basin area, as well as calculating the additional mile and time cost for those vessels that avoid the ATBA in comparison to a standardized trip through the ATBA for each vessel. The same can be done for vessels that continue to transit the ATBA by providing alternative routing and associated cost. Although the ATBA is a recommended (i.e. voluntary) measure, the computer monitoring of vessel routes provides information on those vessels that are avoiding the area and thus provide a measure of compliance as well as those that are not and may not yet be aware of the IMO recommendation to avoid the area. In the first month of implementation, preliminary analyses conducted by Dalhousie researchers found that about 70 percent of the vessels avoided the Roseway Basin ATBA. Researchers have also detected that some vessels that passed through the ATBA on one leg of their voyage avoided the area on their return trip. Seventy percent compliance in the first three months is a very good response from the maritime industry for this new measure. In these early stages, non-compliance is likely an issue of awareness of the new ATBA. Information placards like Caution Mariners are being distributed to mariners in Atlantic Canadian ports through port authorities, shipping agents,and harbor pilots to increase awareness of the implementation of these conservation measures. The 2008 implementation of the IMO sanctioned Roseway Basin ATBA and the 2003 amendment to the IMO mandated Bay of Fundy shipping lanes are two examples of how New England Aquarium researchers and their collaborators are working with corporations and government to not only develop, but more importantly implement, conservation measures for right whales and monitor mariner compliance. These actions will promote recovery of right whales and last well beyond our lifetimes. What does this mean for right whales in Canadian waters? It means that the calves, like Calvin's first calf born in Florida waters in 2005, will have a safer haven in the Bay of Fundy in which to fatten and grow. And on Roseway Basin adult right whales will have a safer place to engage in the activities that result in more calves. Thank you to our partners in right whale recovery! Hi, Jess Taylor here. I've flown aerial surveys with the NEAq team for 3 years now. I took a year off last year when I was traveling around Australia. I've always wanted to go to Australia so it was great! I did some humpback research over there on the west coast, dived the Great Barrier Reef, and saw a few blue whales on an aerial survey, but I really missed right whales and am very excited to be back. I have spent the last month here at the field station in Lubec, Maine. It has been great getting to see some of these familiar whales in close proximity. I got to see a very special whale, Catspaw that I haven't seen since 2005. I saw her on one of my first ever flights, when I was still learning how to take pictures whilst leaning out of a window, spinning in a plane at 1000 feet! So I was particularly nervous when we realized that the whale I had to photograph was giving birth! An event that had never been witnessed before. I was very happy to see her up in the Bay of Fundy with her 2008 calf, right on schedule giving birth every 3 years. Whale Catalog #1632, Catspaw, with her second calf, #3532, male, named Resolution. We have been extremely lucky with the weather since I arrived on the 8th of September and it turned out to be an excellent month. I was able to get out on the water eight days, there was a window of good weather when we managed to get out three days in a row. On the 23rd we couldn't get back to the dock because we kept seeing more whales on our way home! They were just off of the lighthouse on Grand Manan, and eventually we had to leave them before it got dark. During that time we saw over 50 whales on each day! I have felt totally overwhelmed by all that I am learning, and we have had lots of unique experiences out on the water. There have been a few times that we were approached by a curious calf; I have heard whales mooing; and saw SAGs of over 15 animals all rolling, flipper slapping, making noises and underwater exhalations. With a little more time on our hands, Cyndi and I visited a local preschool group to talk to some four-year-olds about right whales. Seeing how excited they were that they lived next to such fascinating creatures reiterates, from a child's point of view, just how amazing these mystical creatures are. Now, with the boat safely hauled out for the winter and the field station packed away, we are ready to head back to Boston. I am glad I had the opportunity to work with such a passionate and affable group of people. We are all sad to leave the bay knowing that on our last day on the water, Sept. 25th, we saw 44 whales. We are all confident that the whales are still in the area, but due to the increasingly inclement weather conditions and deteriorating funding we cannot afford to stay in the area to help protect them. As we all return home, we say our goodbyes. The right whale team is spread out across the country, so the next time we will all be together again will be at the North Atlantic Right Whale Consortium in November. I hope the whales have a safe migration south. I look forward to seeing what whales show up and meeting the new additions to our population. Although our field season is officially over there is still information we would like to make available to you. So keep tuning in to find out more about our efforts to protect one of the world most endangered marine mammals.